Just back from a holiday in Estonia and Latvia. Estonia must be the most wired country I’ve been to – wifi symbols everywhere (strange place to make an annual intertube fast, then). Latvia… not so much. Every now and then in rural latvia there was a giant road sign pointing to “INTERNETS”, generally at a library, where people could access the ‘net. Just shows the importance of libraries to the rural environment. The picture above is from the Vaide horn museum, near the Kolka cape, Latvia. 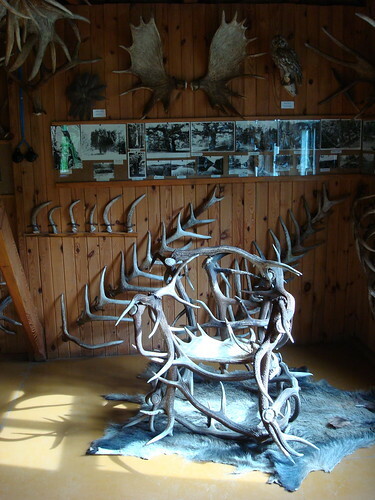 (The horns are not hunting trophies -they are discarded horns found during environmental protection inspections over a period of thirty or so years.) Strikes me as the kind of memory institution that digitisation wouldnt serve very well…. the whole point is the atmosphere of being there. In fact, I can find very little about it on the web at all.